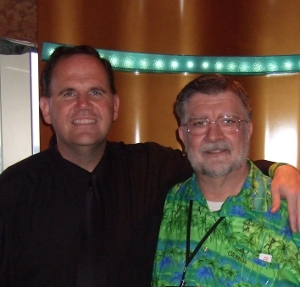 At last year’s cruise, I was in the mid 250’s, and there were a number of people (including my friend Jimmy Moore) who noticed that I was a bit thinner. That was sure a nice feeling! [*] I did plan one exception to the “no-sweetener” rule, and I had a couple of things that I had forgotten were sweetened until I tasted them. Still, I did not add any sweetener to my coffee, and I avoided desserts except for the one night that they had the “special low-carb cheesecake” for the group. I remembered the special cheesecake from last year’s cruise, and that was my one planned exception. However, this time, I noticed that after the first bite, the cheesecake became less tasty, and by the 3rd bite, it had lost it’s appeal to me, so I did not finish it. For the 4-meals-a-day plan, I would get some food items off of the buffet at the Lido after dinner, to have an early breakfast. Georgene and I like to get up quite early, and the breakfast schedule on most cruise ships is geared more towards folks who like to sleep in. So that would be my 1st breakfast, usually consisting of some cheeses and cold cuts, with some cantaloupe or honeydew melon. And, of course, a couple of pats of butter. A couple of hours later, we’d go up and have 2nd breakfast, either in the Lido or the dining room. For lunch, we’d usually get to the Lido just before noon, at which time they would still be serving breakfast, and the lunch buffet was still closed. So I would consider that my 3rd breakfast, with more eggs (and butter), bacon, and sausage. If we had time, we’d go back and get something off of the lunch buffet before leaving the Lido. For dinner, most nights I would order two appetizers, and sometimes two entrees. A couple of times, I also ate some of Georgene’s entree that she just didn’t have room for. I don’t know why, but it would never occur to me to take photos of the meals until it was too late, but I usually had either some red meat or fish (or both) every night. Broccoli was usually the only green veggie they had at dinner, although I had a bit of creamed spinach one night. And I would always consume a generous scoop of butter (come to think of it, I never asked to make sure it wasn’t plastic margarine, but it *tasted* like butter) spread over my meat and broccoli. So, for the whole week, I pretty much over-fed. Of course, I did not eat anything that contained wheat, sugar, or artificial sweetener, with the exception of about half of that special low-carb cheesecake. I succeeded for the most part in not spending any significant time hungry. In fact, most of the time, I was definitely feeling a bit overfed. OK, results time: I gained a little under one pound for the week. My starting weight was a hair over 242, and the weigh-in on the day after I got back was a hair under 243. In the 4 days after I got home, and got back to my regular eating plan (which is another N=1 experiment about which I will be blogging in the next week or so), I lost that pound, along with 2 more, so as of this morning, I’m at 240 lbs. This particular N=1 experiment really had too many variables, but I think I have firmly established that as long as I avoid grain, sugar, and sweeteners, I can eat all of the meat, non-starchy veggies, and butter I can stand without gaining a lot of weight. Just for some perspective, the average cruise vacationer gains about 8 pounds in a 7-day cruise! This entry was posted in Diet, Low Carb Cruising!, Paleo and tagged butter, Cheesecake, Jimmy Moore, Lido, Low-carbohydrate diet, Pound (mass), Sugar substitute. Bookmark the permalink. Don’t forget that you also had a serving of that Sweet Potato Salad that I fixed and that was somewhat …..yucky. I didn’t like it at all. So, all your veggies were not non-starchy, and you still lost the two additional pounds…. I guess I wasn’t really clear, but in the last paragraph, I was talking about what I did on the cruise, not afterward.